Pallets are loaded using inclined gravity rollers which are set at a fixed gradient. Pallets are loaded using inclined gravity rollers which are set at a fixed gradient. As with the push-back racking, when a load is picked from the front face of the rack, the next pallet automatically rolls to the front. Stock is replenished from one side and picked from the other as this Link 51 live storage system operates using FIFO (First in, First out) principles. 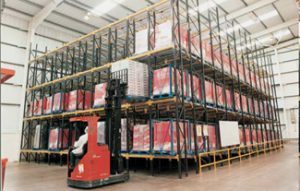 Dynamic live storage provides a warehouse racking system which offers high levels of storage density along with automatic stock rotation. 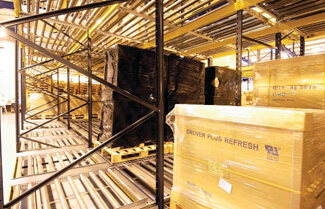 Link 51 Live Storage pallet racking keeps fork lift truck use to a minimum in handling the flow of stocks. To discuss your live storage pallet requirement call us on 01179 555211 or get in touch online. Working to the same principles as pallet live storage, carton live storage is used for hand loading and hand picking stock. Trays or cartons are inclined on rollers and set within the racking at accessible levels for pickers. Goods roll down under the force of gravity from the loading face to the picking face reducing picking time and eradicating picking errors. With Link 51 carton live storage systems, stock is presented precisely at the picking face making stock management easier. This labour efficient racking system is another example of First in, First Out storage and is ideal for fast moving assembly and packing lines. 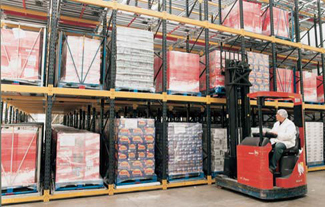 BSE UK can help you make the most of your warehouse space. Let us know what your carton live storage requirements are by filling in a few details and we’ll be in touch shortly.